My return on investment from growing potatoes this season was 3,468%. 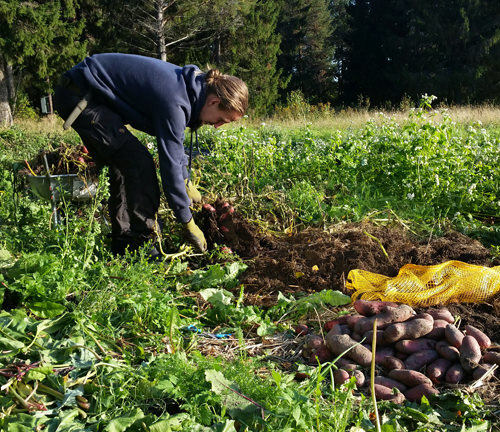 I planted 2 kg potatoes and harvested 69.3 kg (69,365 grams to be exact), pretty much multiplying my potatoes by x34. And this doesn’t take into account the +10 kg of potatoes I had to throw away because of neglected maintenance. It may not sound like much, but we’re a small family (2 adults + 1 newborn) so 69.3 kg will last us a good while. Some of it we’ve already eaten with delight in the form of mashed potatoes, oven roasted potatoes and more less common potato dishes. I’m biased, but I’m certain that my homegrown potatoes are the best I’ve ever tasted. That’s me, picking up the last potatoes right before my lady went into labor and we had to rush to the hospital to meet our firstborn. Now when the harvest is all done we’ve got ~50 kg tucked away in the root cellar, but it’s a bit of an experiment because it’s the first winter I store crops in the root cellar. If there’s anything I’ve learned this growing season, the first season after purchasing this property, is that it’s fairly easy to create food abundance here (given an average summer). Frankly I’m amazed by the abundance of food you get from planting a single potato. You plant one and get not only two or five but up to twenty potatoes from that single potato. In just one season. One of the two varieties of potatoes I grew this season. Small and tasty. So what’s the financial value of this potato harvest? On average I’d pay roughly $5 per 2 kg for locally grown (non-organic) potatoes in the supermarket. Which means that my potato harvest of 69.3 kg has a commercial value of roughly $173. Subtracting the cost for the 2kg of seed potatoes that I bought at the start of the season, which was $24.4, my net “profit” is ~$149. So financially, my ROI was 600%. That’s far off from the 34,682% ROI in terms of weight, but 600% is still a pretty amazing ROI in one season. Good luck getting that ROI in the stock market. But $150 doesn’t sound much in the grand scheme of things does it? Was it worth the time and effort? 34,682% ROI sounds great. 600% ROI still sounds pretty good. But I think the deciding factor when it comes to creating abundance for yourself and your family, when investing in self-reliance, is your ROI per hour. My net profit of $150 doesn’t say a thing unless I know how much time I spent producing this outcome. For example, if I had spent 20 hours to produce this potato harvest that’s just an earning of $7.5 per hour (in reality equivalent to an employee wage of $15 per hour, because these potatoes are tax free). Gladly, I didn’t spend 20 hours to grow the 69.3 kg of potatoes. 4 hours in total preparing the two 8 m x 1.2 m growing beds (19.2 sq meters total). A total of 9 hours, roughly speaking. One thing to practice next year: Improving my harvesting technique. The harvest this year was backbreaking work for sure. This means my $150 net profit is equivalent to earning $16.66 per hour. 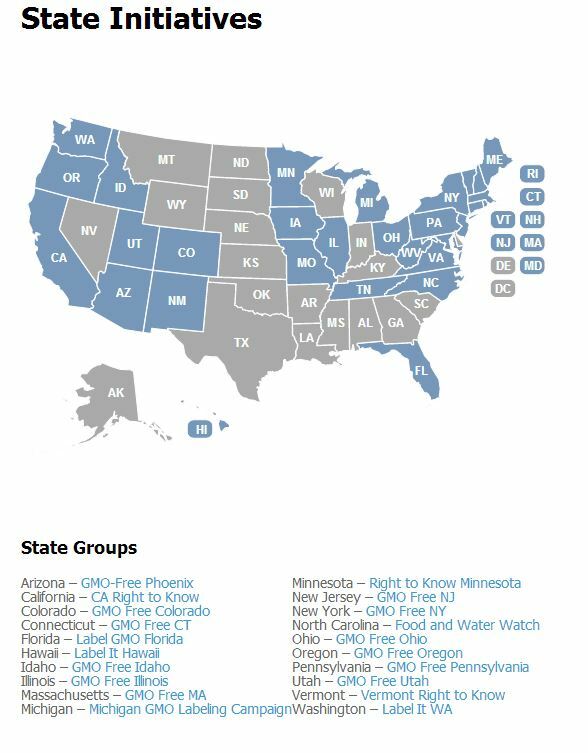 But again, this is tax-free earnings because I’m going to eat it all and in this day and age we don’t have to pay taxes on the food we grow for personal consumption (although this hasn’t always been the case, in the old days you were forced to give a big chunk of your harvest to the church or to the state). But if you’re an employee you have to pay tax on your money before you can go and buy potatoes, which means if you pay 30% tax you’ll have to earn $23.8 per hour to get an equivalent profit. 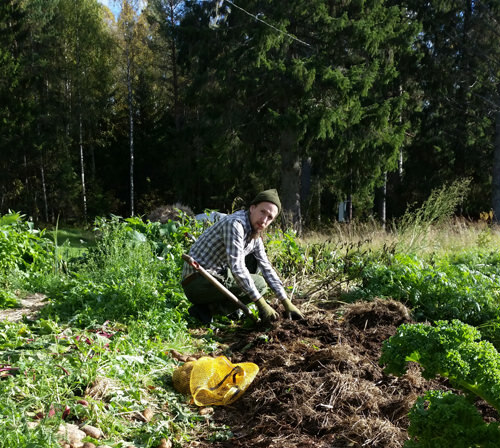 For me though, the government takes pretty much 50% of my earnings here in Sweden, which means my earnings from growing potatoes is the equivalent of earning $33.3 per hour at a job. It means that if you earn less than $23.8 per hour, or in my case $33.3 per hour, you’ll save money by growing your own potatoes rather than spending the time at work. But of course you don’t have to choose one or the other. You can keep your full time job but spend a few hours per year growing potatoes to lower your food bill and increase your food resiliency. It’s a no-brainer for me. I’m fairly pleased with my ROI per hour, but I’m confident I can double it next year. 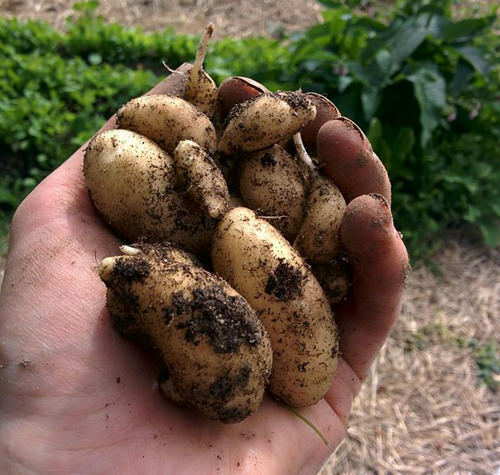 Almost 50% of the time invested in growing potatoes this season went to establishing the no-dig garden beds. So most of the energy went into converting lawn to productive land. Next year I won’t have to do that. I’ll spend a maximum of one hour improving the beds instead of four hours. 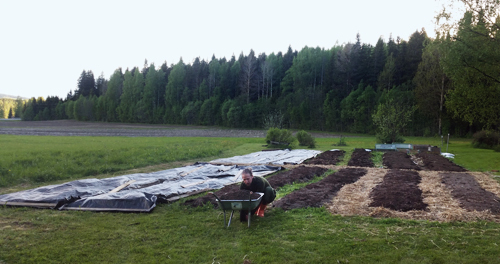 That’s me earlier this year finishing up the no-dig growing beds. A one-time input of energy and resources that I won’t have to do ever again (except for when creating even more beds). I’m also fairly confident I can cut the amount of maintenance in half by adding straw mulch on 100% of the bed area. This will cut out the need for weeding and will also help prevent sunburn. If I can cut the amount of time spent in half and I get an equivalent harvest next year that means I’m potentially looking at a net profit of $33.33 per hour, or pre-tax $66.66. Now even if I made $66.66 at work it would still make all the sense in the world for me to spend a few hours per year growing potatoes. I mean, who doesn’t like to save money? 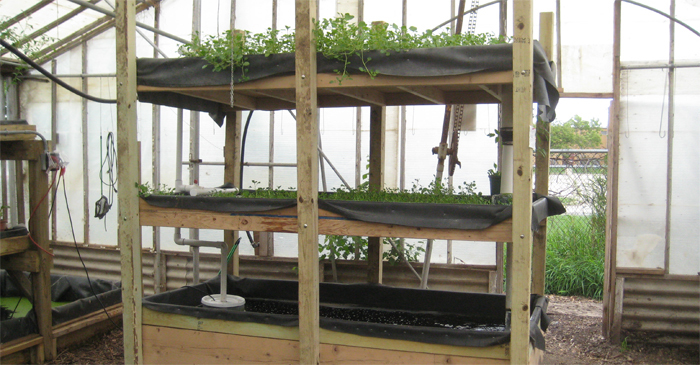 In fact, this experiment tells me that it makes sense for the vast majority of workers in temperate climates to grow their own potatoes as a staple crop. Unless you’re a high earner, like a really high-earner, chances are you’ll save a big chunk of money growing potatoes. Even with a tiny yard you can still grow a decent amount of potatoes, and I can attest that it doesn’t take many hours out of your time either. Self-reliance is worth it, not only in terms of the freedom and resilience it brings you but also financially.